Invented by Jacque Egnatic, a second generation bench jeweler, the Jeweler in the Dishwasher Basket is exactly what it sounds like—an easy way to clean your jewelry and your dishes at the same time. Patented and Made in the USA, the Jeweler in the Dishwasher is a shining example of American ingenuity. 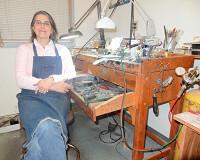 With nearly 40 years in the jewelry business and just as many doing dishes, Jacque was struck by the similarities between the everyday household dishwasher and the ultrasonic cleaners that jewelers use to remove dirt and bring back the sparkle to diamonds, precious stones, platinum, and gold. Simply put your rings, earrings, bracelets, and necklaces in the designated areas, secure the locks, and place the basket on the top rack of your dishwasher. Then, load the dishes, add detergent, and run the washer as usual. 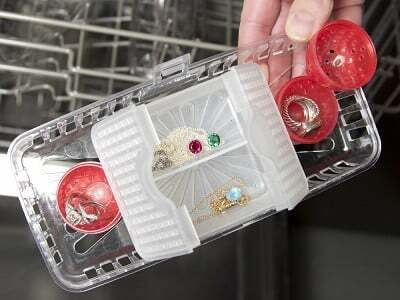 Why go to the jewelry store when you can clean your gems like a pro just by running the dishwasher. Invented by Jacque Egnatic, a second generation bench jeweler, the Jeweler in the Dishwasher Basket is exactly what it sounds like—an easy way to clean your jewelry and your dishes at the same time. Patented and Made in the USA, the Jeweler in the Dishwasher is a shining example of American ingenuity. With nearly 40 years in the jewelry business and just as many doing dishes, Jacque was struck by the similarities between the everyday household dishwasher and the ultrasonic cleaners that jewelers use to remove dirt and bring back the sparkle to diamonds, precious stones, platinum, and gold. 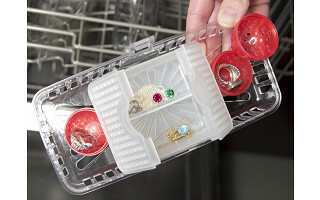 Simply put your rings, earrings, bracelets, and necklaces in the designated areas, secure the locks, and place the basket on the top rack of your dishwasher. Then, load the dishes, add detergent, and run the washer as usual.